It occurred to me that I don't update TMNT Entity nearly enough. Unfortunately, I don't have time to write lengthy reviews or essays every single day, thus my sporadic updating schedule. And when I'm dedicating my daily allotment of Turtle Time to translating TMNT manga, a payoff readers won't get to see for some months, that just makes keeping a visable update schedule for TMNT Entity that much harder. So, to inject some cheap filler into my blog, I'll try to keep you folks entertained with selections of some of my favorite pieces of Teenage Mutant Ninja Turtles artwork, or "Awesome Turtle Pictures". And believe me, there's plenty of it. *I hate his X-Men stuff, but this was pretty sweet. *Super TMNT Tournament Fighters II Turbo EX Special Champion Edition. *When your box art is the best part of your game. *He'd be even scarier with a Cajun accent. *The original one-sheet for "Alligator II: The Mutation". *The pants-wetting art of David Rapoza. *It's a Tokka type of Tuesday. *You can tell it's 1985 because Eastman and Laird are still drawing. *A better Derek Yaniger than Derek Yaniger. *Not to be confused with the orange-flavored beverage. *Those times they kinda sorta met Gizmo. *The history of Krang's amazing pecs. *Mamma-Mia! That's-a some good art! *Today, on a very specific episode of Awesome Turtle Pictures. *A cover so nice they made it twice! Then 20 more times. *I hope this doesn't end in a Jim Lawsuit. *Wouldn't Raph have been more appropriate? *It's like the '90s threw up. *And these are the "normal" ones. *Come for the Slash, stay for the Critters. *This ain't yer daddy's comic book, fanboy! *Junk Man in the Trunk Man. *Chote... Chote... Isn't that a college for, like, drama kids or something? *"You guys are stupid, ya see, 'cause they're gonna be lookin' fer ninjas!" *This is #31, but it probably should have been #30. *They scare because they care. *A million Shredder pin-ups to choose from, but this is one of the best. *These Italian artists are really good at painting the Turtles. Go figure. *Not quite as insane as his He-Man stuff, but close. *This was an issue of TMNT Adventures, I'm sure of it. *"It's over, Leonardo! I have the high ground!" *TMNT Volume 3, from an alternate universe. 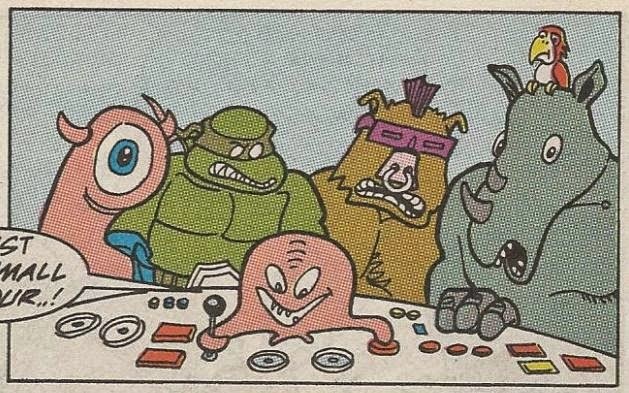 *Krang in his tiny little spaceship is the best part. Nice! Keep on translatin' away, Mark! Oh, man, your descriptions for these pics are hilarious! I'm not sure I get the "Derek Yaniger" reference though. I can't see any similarities between Yoshioka and the stuff posted on Yaniger's website. Check out Yaniger's work on Marvel's Transformers Generation 2 comic book (I understand he mostly just draws tiki stuff, these days). Yoshioka based his art style on Yaniger's during the G2 period, and though they're very similar, I think Yoshioka's does the aesthetic much better.